We bring Atari to the party! The 16th and 17th of September the ‘Retro Computer Festival 2017’ took place in the ‘Centre for Computing History’ (CfCH) in Cambridge, meant as a fundraiser for the museum. During the festival several exhibitors showed their products, collections and even replicas to the museum’s visitors. One of our members jokingly suggested to visit the festival a couple of months ago, but surprisingly there was genuine interest within the team and even with the organisation of the festival itself. So we started preparations by deciding on a travel budget and started creating a preliminary planning: What to bring with only hand luggage available? As bringing luggage was out of our budget. So, we reached out to the CfCH and asked if we could borrow machines, screens and joysticks for the weekend. This turned out to be no problem at all, so our packing list was now limited to peripherals like memory expansions, video mods, cartridges. Hardware aside, we also wanted to hand out some paperwork like flyers and business cards. These were designed the following week and ordered from an online printing house. Then there was the stuff we could reuse from previous invasions like the homebrew folders and the document binders (our library). The info-beamer presentation was reworked and new items were added to it. For those that like numbers, the presentation consists of at least 25 homebrew items with 121 images (duration: 12m:30s), 17 images of (classic) advertisements and posters among others things (duration: 02m:50s), 30 videos ranging from (classic) commercials, homebrew ads and 3d renders (duration: 36m:02s). Resulting in a total of 51m:22s with unique material. Friday morning September 15th at approximately 8.00 we (Freddy and Dennis) met at Schiphol Airport. The first hurdle for the invasion, getting through customs with all our equipment, was overcome without issues and the flight to the UK was without issue as well. At Luton Airport we had a direct connection for the bus taking us to the car rental centre therefore not much later our gear was loaded into the rental car and we were ‘en route’ to Cambridge. Within seconds we were driving on the wrong side of the road and were alerted to that mishap by a fellow driver that gave us a very audible warning. Unfortunately the unlimited mobile internet plan had some startup issues, so we were forced to find our way using a mobile phone instead of the ‘carplay’ setup in the car. Lucky for us the trip took a little over an hour and was without (big) issues. Upon our arrival at the Sheffield Lodge the rooms were being cleaned, so without having seen our rooms but with the keys, we left for the CfCH. Half an hour later after a slight unplanned detour we arrived at the CfCH. Where ‘the two guys all the way from the Netherlands’ were received with full honours. We got a quick tour of the museum and apologies that our setup was not ready yet, which was very understandable as we were three hours early. We had not had anything to eat since the flight so we decided to get lunch somewhere in the vicinity of the museum and agreed we would return in an hour or so to prepare our setup for the weekend. At walking distance we found a shopping ground that was home to a Subway lunchroom, where we ordered some sandwiches and discussed our (very positive) first impression of the CfCH and its staff. Upon our return the tables as well as several Atari home computers were ready as agreed upon before lunch. The power supplies for the computers looked to be the so called ‘Ingot’ variants - these supply more than +5V upon failure and take several components of the Atari computers with them as they fail. Luckily we came prepared and agreed that we would use the USB power cables we brought during the event. The first item that got unpacked and was setup on the spot, was our time lapse camera (scan the QR code for the result). The other stuff quickly covered more than the two tables reserved for us. The hardware we were to lend for the weekend was unmodified and therefore the video quality was lacking. Between showers people were bringing more and more equipment from storage and returned it when image quality was not up to (our) standards. Everything was done in order to set us up with usable hardware and screens. At 7pm (local time) we thought we were ready for the opening of the event the next day and asked around for a good restaurant nearby. We were directed to a nearby pub named ‘The Wrestlers’, which was extremely crowded, but we managed to find a table for two and ordered two Thai plates that were outstanding. So with our bellies full we returned to our hotel to enjoy some well deserved sleep, although that turned out a little different than expected. Hotel ‘Shelford Lodge’ was old but tidy at first glance. The next morning after a shower in a moldy bathroom we started to rethink our first impression. The breakfast that was included in the price turned out to be of limited choice (lots of jams though) but fortunately the coffee machine was working. Immediately after breakfast we headed to the shopping center where we had our lunch the day before to get some sandwiches and drinks for the remainder of the weekend. As the layout of the shop was different from what us Dutchies were used to, it took us a while to find and pay for everything we needed. With time to spare for the opening of the event we arrived at the CfCH where we got news that the folks that were the man the two tables besides ours were not going to make it. We rearranged the setup of the previous day by moving the 2600 with Sijmen’s “Defend your castle” to the other table and also added the 7800 that we rejected a day earlier due to bad quality video to the table. Running ‘Apple Panic’ off the Mateos’ Multicart you did notice the rolling video too much. During the day we met with a variety of people: visitors, exhibitors and employees/volunteers for the CfCH and we demonstrated the stuff and software we brought. While we were there we took turns to take a look at the other exhibited things and the museum itself. We agreed that the atmosphere and the way things were on display was top notch. Among the other things on display were several unique items and prototypes as well as diy kits and modern fpga based systems. The first day was over in no time and after pizza dinner we noticed how tired we were and so we headed back to the hotel. Too tired to do anything worthwhile we went each to our own room to get some rest. Some of the other guests had a (loud) disagreement over something and when that was over another guest started ringing the reception bell every few seconds for more than 5 minutes straight. At approximately 1am everything got quiet again, lucky for us, it was our last night here (ever!). We left hotel ‘Shelford Lodge’ as quickly as possible and headed to the CfCH for the last time. Our extra table space was cleared again for a new exhibitor. We lent him our travel plug to power his Apple Lisa and moments later we were taking pictures of a Brazilian Apple II clone in an Atari 1200 case he brought. This day brought a lot of new visitors and exhibitors so it was with mixed feelings we started packing early as we had to catch our flight later that day. Just before we departed we donated some of the things we brought to the museum not just to make room for the items we purchased at the museum shop. Upon leaving we noticed the lady at the reception was already busy with putting together the pac-man paper foldable. Unfortunately we found out at the airport that our flight was delayed. The flight itself was without issue and so we arrived at Schiphol just before midnight, the end of a successful Atari Invasion on Tour. In the next days we stitched together the images made with the time lapse camera into a video we shared with the museum and the rest of the world. We got word from the folks at the CfCH that the festival was a big success with nearly 300 tickets sold at the door, with Sunday being the busiest day in history. Feedback from exhibitors, customers and volunteers were very positive (we concur) and therefore there will be a second edition of the festival next year. We already cleared 15-18 september 2018 in our schedules! ABBUC JHV 2017Elk jaar houdt de Atari Bit Byter User Club (ABBUC) haar ‘Jahreshauptversammlung’ (JHV). Tijdens een JHV zijn er tafels beschikbaar waar leden Atari gerelateerde zaken kunnen demonstreren, of hun (dubbele) hard en software verkopen. Verder krijgen de verschillende ‘regionalgruppe’ het woord en is er ruimte voor discussie over club gerelateerde zaken. Er wordt bekendgemaakt wie de ‘ABBUC Bundesliga’, hard- en software competities hebben gewonnen. Inmiddels zijn we aangekomen bij JHV nummer 32, gehouden op 28 oktober 2017 in het ‘Bürgerhaus Süd’ te Herten. Met het verstrijken van de tijd is het publiek veelal grijzer en kaler geworden, zo ook de vier Atari Invaders die zaterdagochtend vroeg aan de reis begonnen. The preparations for the 4th annual 'Atari Invasion' of the HCC Commodore Club meeting are in full swing. 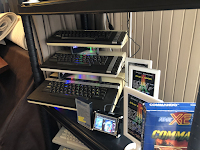 As we send out updates to the crew, the Invasion plans take shape: celebrating the 40th anniversary of the Atari 8-bit homecomputers will be our main focus. The museum rack and display cabinet will be there as usual. We will take you on a trip through time, with our 'eXperience Locations'. We will have online, multi-platform, multi-user events. Not just the info-beamer screens will show moving pictures and information: our own E.R.I.C. - if time permits - will have a spot amongst Atari 8-bit home computers performing tricks they were never designed for. Ofcourse we will make sure that there is still plenty of space available to play games on Atari computers and emulators. Atari Invasion 2k18 On February 17th, at approximately 8.45 the first invader arrived at 'het Trefpunt' in Maarssen. He was soon joined by the other invaders and at 10.00 the buildup was well underway. By the time the general assembly of members of the HCC Commodore ig was finished, most of the gear was hooked up and the Invasion started.